For many Metal lovers, who know this album, it is the best female fronted Metal albums of all times!! The voice of Barbara Maltese is so powerful, and the music is fantastic. This is 100% Metal in the mid 80s style. Barbara Maltese grew up in New York State, and later studied in Boston to become a music teacher. She played piano, and later started to sing. Her first band was TIME SQUARE where she covered Hard Rock songs. Later she moved back home and joined the band SHIVER and also worked in a recording studio. The producer John Pillay ("JP") asked her to record some songs with him in LA, and so she moved over there to start her singing career! JP wrote songs for her, and helped to put together a band. 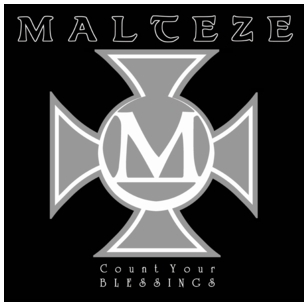 She called the band MALTEZE, using her name with a cooler sound, and because of her family's origin, who came from Malta (that is also, why she uses the Maltese cross). In 1987 they recorded the album "We came to Rock". The style was a mix of Rock, Hard Rock and Blues. Only 500 copies were made from this record and it is a rarity now. Later she realized that she wanted to sing more heavy, and hired a new line up. She needed a long time to find the right guys through advertisements in the LA music classifieds papers. Finally, in 1990 the masterpiece "Count your blessings" was released! 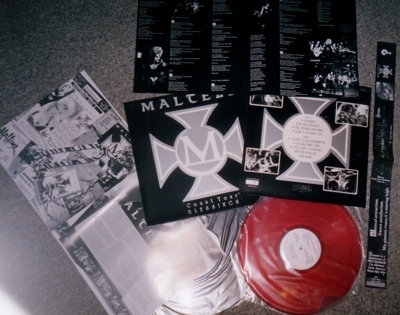 There was also a European license pressing, but both were not well promoted, and most American and European Metal fans never got to know this incredible piece of work! As they never sold a lot of them, both CD versions are rare now! Barbara concentrated on booking shows, and left the promotional work to the record company. But the promotion was almost like zero, especially in Europe where this music still ruled! In the US the album came some years too late, as in 1990 the big Glam wave swept over the world, and soon came the Grunge era, which killed the rest of the US Metal scene! The band only played in small clubs in the Los Angeles region, and got no support to open for bigger bands or to play in other cities. But they were very close to play one incredible show, at a festival in Moscow!! The plane was booked for the festival at 25. of August 1991, but then the military coup happened, and everything was cancelled! The record company pushed Barbara to change to a more stylish feminine outfit, like Madonna, and even to get breast enlargement!! But she refused to do this, and instead, cut her hair very short! Recording of another album started soon. Barbara put all her money, which she had earned with a day job, into the recording. But main producer JP got too much into drugs, and nothing usable was recorded! So after 10 000$ she pulled the plug, and after all the disappointments, she moved to Texas, which was the end of the band. She started to sing in a Blues band in L.A. and continued in Texas with this music, with the cover band THE TIPSY GYPSIES. In 1999 she was one of the founders of the band COSMIC DUST DEVILS, which play Rock, influenced by Country music ( www.cosmicdustdevils.com ). The rest of the band is spread now all over the US! Bass player Kriss Marx is back to Cleveland. Drummer Mike Voss moved to Georgia and has his own construction company. He sold his drums, but started to play lead guitar and write songs. His actual band is called THE SUPERLATIVES ( www.thesuperlatives.com ). Steve Cenker is still singing and playing rocking guitar with a southern-rock feel in the SAM MORRISON BAND They perform all over the West Coast ( www.sammorrisonband.com ). Masami Fujimaki calls himself now Sammy Fujimaki and is still an active and talented guitar player. His major influences these days being Gary Moore, Steve Vai and Tony McAlpine. He is interested in putting a band together, and is searching for the right musicians to work with. I am very proud to offer this Metal album masterpiece now to the fans, in the only way that will survive the times, as vinyl! Special thanks to Rita and Toine van Poorten, for the permission to use their interview with Barbara in "Metal Maidens" # 31 for this biography ( www.metalmaidens.com )!! It was a very great honour for me, to get in contact with band leader Barbara Maltese, and to get the permission to release this wonderful album finally as LP! There were 2 CD editions, but both were sold out long time ago, and sadly, the band's name was almost forgotten! Vinyl lovers still are the die-hard fans in the scene, and I hope they will spread the name of the band, so it will find the place it deserves in Metal history: right at the top! !